Made with all natural ingredients, EcoEars is safe and effective DIY ear infection relief. EcoEars has received 93.7% positive customer feedback, which means that after helping over ONE HUNDRED THOUSAND dogs and their families, it has been found to work in 94 out of every 100 cases! Dog ear infections can be extremely painful. But with EcoEars you don’t need to helplessly watch your pet suffer, thanks to its fast-acting relief. Plus, you can save hundreds of dollars on vet visits, lab tests, and prescribed medication. Not everybody can afford the standard treatment. But even if the usual $300-$1000 isn’t a big deal for you, $22+shipping still gets you a much faster resolution. EcoEars is made with all-natural ingredients that have disinfectant and antimicrobial properties. The formula is completely safe for your dog. Many of our customers use it on a regular basis to prevent the ear infection from developing in the first place. Get your 8oz Bottle Today for Just $21.88 ! EcoEars is 100% natural and safe to use. It will save you hundreds of dollars on vet visits, expensive lab tests, and medicine. Most importantly, it is very easy for you to quickly relieve your pet’s suffering at the comfort of your own home. Just look at the super simple instructions, or refer to the more detailed, easy-to-follow directions located at the bottom of the page under the 'Instructions' tab. If for any reason you are not satisfied, you have 365 days to tell us about it, and we will give you a 100% refund no questions asked. On the other hand, when you’re relieved to see that your dog’s ear infection is gone, and they are no longer suffering, please leave a review and share with other dog lovers that this affordable, easy-to-use, and effective dog ear infection remedy is not just hype and hot air. NOTE: EcoEars for Dogs should only be used on pets 12 weeks and older - we do not recommend this product for puppies younger than 12 weeks. Get your 4oz Bottle Today for Just $15.88 ! 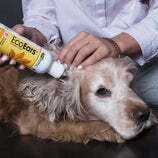 EcoEars Dog Ear Cleaner — Infection Support Formula is a blend of all-natural and organic ingredients. Contains all-natural, plant-based disinfectants proven effective by tens of thousands of customers. Relieves bad smell, itch, and gunky discharge resulting from dog ear infections in as little as 24-48 hours*. Effective on most dog ear infection-related conditions, when used as directed. The 8 fluid oz. bottle is good for extended treatments (if needed). A botanical commonly used to treat skin irritations. It helps dry up pus and soothes inflamed skin. Made from natural grains like corn and barley, this alcohol helps to quickly air dry your pet after spraying. Produced from plant oils, vegetable glycerin has a hydrating effect, making it useful for treating burns and dry, irritated skin. Helps blend the oils and other ingredients in this product and also promotes a soothing, lubricating effect when applied topically. A naturally occurring inorganic compound with antifungal and antibacterial properties that also helps the infection heal faster. A powerful antiseptic and disinfectant that aids in healing wounds and infections and also reduces swelling and inflammation. 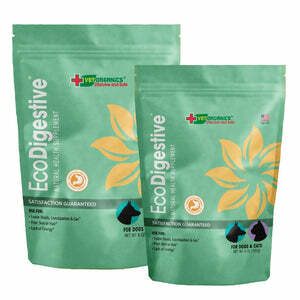 A powerful antimicrobial, anti-fungal, anti-bacterial, and antiparasitic that is safe for humans and animals. Mullein is a safe medicinal herb that has been used for thousands of years to ease pain and speed recovery time. It is commonly used to treat fungal and ear infections as well as general inflammation. This medicinal herb is an excellent source of flavonoid compounds and essential oils with anti-oxidizing, anti-inflammatory, antifungal, antimicrobial, and antibacterial properties. Fill affected ear canal with EcoEars Dog Ear Infection Formula and massage gently but vigorously for 90 seconds. Wipe out with a facial tissue or cotton ball. You may see improvements within a few days; however, we recommended using it twice per day as directed, for a minimum of 10 or 15 days for best results. For severe and persistent ear issue, EcoEars may be safely used for up to 8 weeks at a time. For use only in dog's ears. Do not use for controlling fleas or for any other use on your pet's body. Do not use on external skin problems. Do not use where open wounds can be seen. Ensure your pet is consuming a nutritionally complete diet. If blood is present, do not use this product & see your vet immediately! How often should this be used? It depends. If you’re using to treat symptoms of an infection we recommend to treat the infected ear(s) 2 times a day for a minimum of 10-15 days. It is extremely important that you continue treatment without interruption and finish the 2 times a day for a minimum of 10 days. If the infection is a recurring or severe one, we recommend continuing the treatment for 15-20 days for best results. There is no need to repeat treatment after the 10-15 day recommended cycle; however, some people prefer to treat once per week for “maintenance.” Although maintenance is not necessary, the ingredients used are all natural and gentle and will not harm your pet should you perform an extended course or maintenance. If you use it as a maintenance it depends on your dog. Some pet owners like to start with once per week and then adjust as necessary, depending on your dog’s need. Hotter summer months and other health issues may contribute to how often you may need to use it. Some pet owners use EcoEars just monthly to maintain healthy and clean ears. We just ordered EcoEars. Our dog has scratches on her ear from her scratching the itch. Can we still use the EcoEars with the scratches present? EcoEars contains some alcohol in it and it feels cool to the touch. In many instances, a pet could react to the coolness of the alcohol and is not in any pain. When using EcoEars, it’s best to have the solution at room temperature. The only instance where it may sting a little is if there are any open cuts or scratches inside the ear. Please contact us if you are having problems using EcoEars on your dog. What is the percentage of tea tree oil in EcoEars? I understand it’s tolerated in dogs in small amounts. The percentage of tea tree oil in our formula is completely safe for pets, and is within the recommended amount to be used for dogs. Do your products require a prescription? EcoEars is a natural ear cleaner, not a medicine – so it does not require a prescription. Our formula includes all-natural extracts selected for their antimicrobial and disinfecting properties which are designed to “dis-infect” your pet’s ears. EcoEars for Dogs is made with all naturally derived ingredients: Denatured Grain Alcohol, Organic Mullein Leaf Extract, Witch Hazel Extract, Rosemary Extract, Ionic Silver Solution, Boric Acid, Vegetable Glycerin, Tea Tree Oil, Polysorbate 20 (food grade). How long does the 8 oz. bottle last or treat? One bottle is more than plenty to treat a medium-sized dog for the minimum amount recommended (10-15 days). We estimate you can expect to about half a bottle for that. It may depend on how much your dog weighs and the breed. Typically, if your dog is less than 125 pounds then one bottle is enough. You may use any left-over EcoEars after treating an infection as a maintenance cleaner to keep your dog’s ears healthy. I purchased EcoEars for Cats by mistake. Can this product be used on my dog? You may use EcoEars for Cat on your dog. For best results, we recommend using the dog version of EcoEars on your dog. EcoEars for Cats has the same ingredients as EcoEars for Dogs EXCEPT for Tea Tree Oil, which means the Cat formula is slightly milder. It’s excellent for dogs with exceptionally sensitive ears. Can I use this product as a preventive cleaner? Or should I use only if infection is present? Yes! Many dog owners love EcoEars to keep their dog’s ears healthy and gunk free. You don’t have to wait for an infection to crop up to use EcoEars. We have from many dog owners who report that their pups learn to enjoy their regular ear treatment and massage. 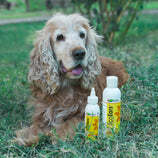 Regular use keeps the pH of your dog’s ears in balance and also dries humid ears to fight against infection. Does this product work for bacterial infection? Yes, both of our EcoEars products (the version for Dogs and our EcoEars for Cats) are effective against bacterial infections (often treated by antibiotics), as well as fungal infections (such as yeast infections) which do not respond to antibiotics. Will the alcohol burn my dogs ears at all? We consider alcohol to be an essential ingredient because it acts as a drying agent and helps to cut down “biofilm” in the ear. The alcohol we use is derived from Grain (never petroleum distillates). That said, any alcohol feels cold to the touch and though it does not sting, it may agitate your dog the first few times you use it. Also, never use EcoEars if any blood is present in the ear unless directed by your vet. Is EcoEars for Dogs also safe for cats? For cats with ear issues, please consider our product EcoEars for Cats. The cat version does not contain tea tree oil, which some cats may be sensitive to, even in the small amounts used in our dog product. I am scared to use EcoEars because there is Tea Tree Oil in it. Is this safe? EcoEars is perfectly safe to use, Tea Tree oil is used but at VERY low concentrations which are known to be safe. (At high concentrations, Tea Tree oil can cause very severe irritation and other problems, but at low level concentrations, it is a great natural antimicrobial.) If you absolutely do not want to use any product with Tea Tree Oil, please consider EcoEars for Cats, which does not contain Tea Tree Oil. Is EcoEars safe to use if the eardrum is ruptured? It happened 6 mos ago. We do NOT recommend using EcoEars on any pet with a ruptured eardrum unless directed by your veterinarian. Ruptured eardrums or any signs of blood are indications that need to be treated ASAP. Does this med work for ear infections of a dog’s ear without seeing a vet? They want $140.00 to help him at the vet’s. It is always best to see your vet to make sure to make sure you have the correct diagnosis. Once you know your dog has an ear infection (bad smell, discharge, etc.) you can safely use EcoEars to clear the problem and eliminate the symptoms. EcoEars is not a medication. It is a natural disinfecting cleaner that has strong antimicrobial properties, and therefore no prescription is necessary. After the initial 14 days of treatment, how often can I use this product? Can I use it weekly for maintenance? EcoEars can be used safely for extended periods of time if necessary. For maintenance, we suggest using it once per week. Will EcoEars Interact With Other Medications? EcoEars is all natural and won’t interact with any medication dog may be taking. However, your dog should not use another ear product at the same time as EcoEars. If your dog is on an oral antibiotic for her ear infection, you should complete the current cycle according to your Veterinarian’s instructions. Is EcoEars Safe to Use on My Puppy? EcoEars can safely be used on puppies aged 12 weeks and older. EcoEars has not been approved for puppies younger than 3 months of age. We recommend that you consult your veterinarian. Will EcoEars Dog Ear Cleaner Work on All Types of Infections? To be clear about this, EcoEars is a natural ear cleaner, not a medicine. 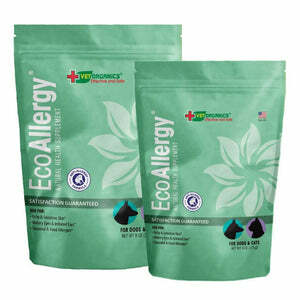 The all natural ingredients in EcoEars are natural disinfectants which are designed to “dis-infect” your pets ears as opposed to “treating an ear infection.” We are contacted almost every single day by customers who tell us that their pet’s infection went away permanently after years of fighting these difficult symptoms. However, because EcoEars is not listed as an FDA approved medication, no claims can be made regarding its effectiveness for treating dog ear infections. Can I Use EcoEars on a Pregnant or Lactating Pet? If your pet is pregnant or lactating, EcoEars should only be used under the supervision of your Veterinarian. My Dog Cried or Whined When I Applied EcoEars. Should I Continue Using It? If you see blood or your dog has an open wound in the ear, EcoEars should not be used unless recommended by your veterinarian. Having said that, there are two factors at play. First, one of the ingredients in EcoEars is Alcohol. As you know, alcohol is cool to the touch. In many instances the pet is reacting to the coolness of the alcohol and is not in any pain. We feel that the benefits of Alcohol in EcoEars far outweigh the temporary discomfort the dog experiences due to the Alcohol. Second, in many cases, the skin can be extremely irritated and when first applying EcoEars it can sting a little. This is common and it goes away a few minutes after the treatment ends; just like when you clean a child’s wound. The vast majority of our customers who experience whining and crying tell us that the redness and inflammation clears up significantly within a couple of hours to a couple of days and their dog no longer whines and cries with subsequent treatments. If your dog whines or cries you can try adding EcoEars directly to a paper towel or cotton ball and swabbing the ear. You can also start out once per day and move up to twice per day once the irritation goes away. Every dog is different, however if your dog continues to cry beyond the first day or two, you should take her to the vet for an examination. Will I Have to Repeat This Treatment? The vast majority of dogs see improvement within a day or two and have all of their ear infection symptoms cleared within 10 days. There is no need to repeat treatment after the 10 day recommended cycle, however some people prefer to treat once per week for “maintenance.” Although maintenance is not necessary, the ingredients used are all natural and gentle and will not harm your pet should you perform an extended course or maintenance. For severe infections which have seen improvement but may still show some symptoms, an extended period of use of 20 days is recommended. If after 20 days, there are still signs that the problem remains, please discontinue use and see your veterinarian. Typically dog ear infection symptoms will begin to improve in just a couple of days and you should see noticeable results within a week. It is extremely important that you continue treatment without interruption and finish the 10 days. No skipping days unless advised by a veterinarian. If the condition persists or worsens, please consult your veterinarian. Are There Any Negative Side Effects From This Treatment? None what so ever. If your pet acts ‘out of the ordinary’ see your Veterinarian immediately. Note that after a treatment many dogs will run around rubbing their ears on whatever they can find. Do not be alarmed, as this usually goes away after several minutes. Do I Need to Clean My Dogs Ear Before Each Use? There is no need to clean your dog’s ear prior, however dog ear infections can emit strong odors and fluids, and additional cleaning will not hurt the process. Many people perform extra cleanings to avoid unnecessary mess around the house. I See Dried Blood in the Outer Ear. Will EcoEars Help? EcoEars will help with the underlying cause of the infection, however fresh or dry blood could indicate a ruptured ear drum. For this reason, you should first have your dog examined by a veterinarian prior to using EcoEars or any ear product. Will EcoEars for Dogs Work on My Cat’s Ear Infection Symptoms Also? 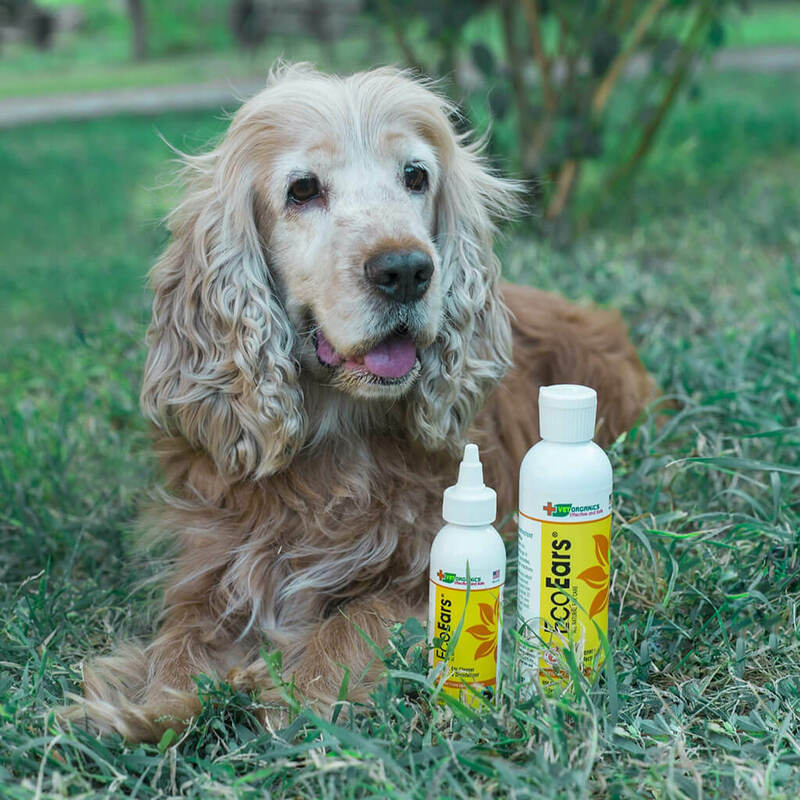 Even though the concentrations of the ingredients used in EcoEars are safe, EcoEars for Dogs contains Tea Tree Oil which some cats are hypersensitive to. We therefore recommend that EcoEars be used only on dogs. Try EcoEars for Cats for a safe ear cleaner for your kitty.